Delight your customers with creativity that keeps them coming back for more. According to the Association for Data-Driven Marketing and Advertising, highly creative campaigns can uplift business results by 50%. 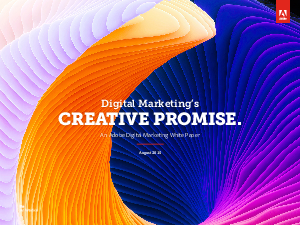 Digital Marketing’s Creative Promise, a new Adobe white paper, shows you the link between creativity and profits. Learn how to make your brand’s creativity shine and business revenue soar.